Redshirt senior Kevin Hodgeson throws the ball to first base during a drill at a practice last week. Updated: Feb. 11, 2019 at 4:42 p.m. Baseball will look to capitalize on the health of its pitching staff to build consistency from the mound this season. 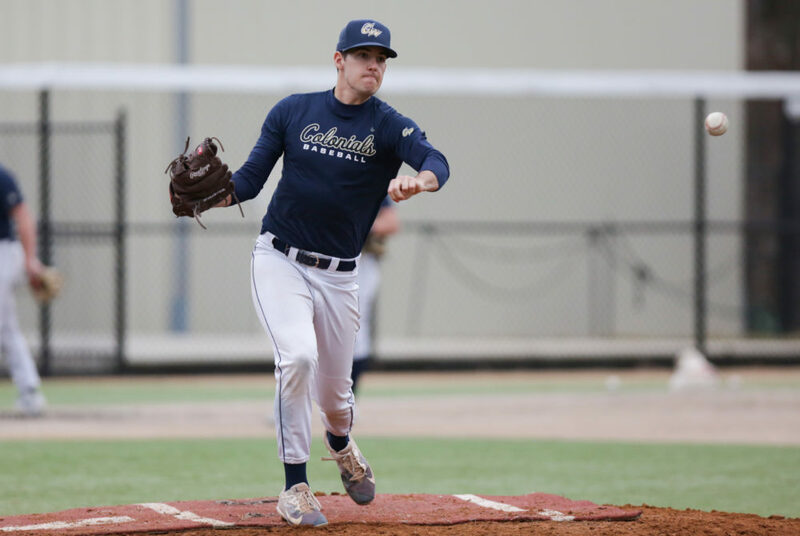 The Colonials struggled to maintain their starting rotation last season as key pitchers like redshirt senior Brady Renner and junior Elliott Raimo were kept from the mound with injuries and the team had to rely on its bullpen. 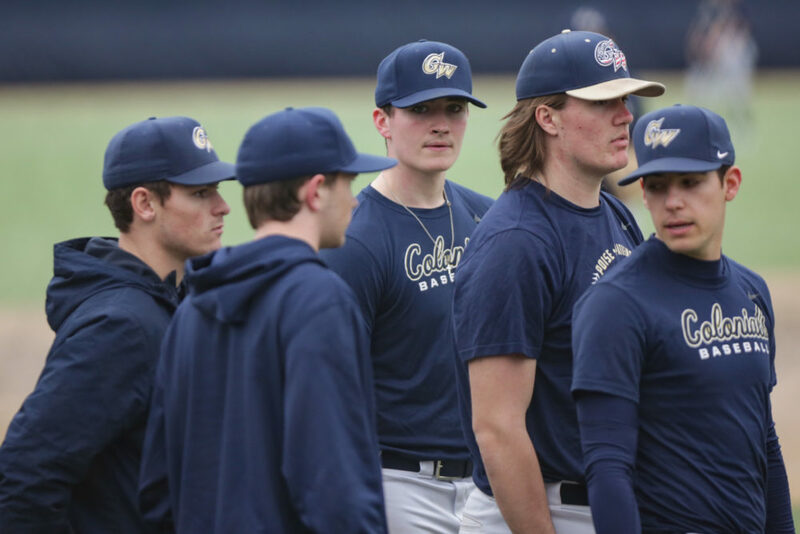 With the duo set to return to the rubber this season and a handful of new faces on the roster, the Colonials are heading into the 2019 season with the luxury of a deeper pitching staff. Pitching coach Rick Oliveri, who is entering his third season with the team, said the coaching staff established workout routines for each player, which has resulted in healthier arms and bodies heading into the season. “Guys have bought into our preparation in the weight room and our mobility program and our throwing program so we’re excited about the health of our pitching staff right now,” Oliveri said. While Raimo continues to battle back from a shoulder injury, the Colonials hope the return of Renner to a rotation already featuring junior Jaret Edwards, senior Nate Woods and a core of transfer players will provide much-needed stability from the hill. At the end of last season, the Colonials saw two of their top bullpen pitchers, Isaiah Pasteur and Will Kobos, selected in the Major League Baseball draft. Oliveri said the bullpen remains one of the team’s “question marks” heading into the season, but he hopes contributions from returners including senior Pat Knight, junior Andrew Wheeler, redshirt senior Kevin Hodgson and sophomore Trevor Kuncl – now a two-way player for the team – will help the Colonials later in games. “Getting the last out of the game is hard, especially when you’re on the winning end in a close game, so we’re going to be asking guys to step into that role,” Oliveri said. The Colonials will have 19 options on their pitching staff heading into the season, the same number as last season. But with a mix of 11 upperclassmen and eight underclassmen on the pitching staff, the team will turn to its veterans for leadership. Head coach Gregg Ritchie said the team’s transfers, like junior right-handed pitchers Keagan McGinnis and Cal Stalzer, will “fill the gaps” by pitching in extended middle innings, but the backend of the bullpen will be in rotation until somebody stands out. Freshman pitcher Chris Knight stands with his teammates as they wait to take part in a drill. With a slew of new faces on the mound, Ritchie said he will be using more pitchers during games in the early part of the season to build up his throwers’ arms while also testing out how players will fit into the pitching lineup in midweek starts. Oliveri said transfer juniors Stalzer and McGinnis can “command a presence and pound the strike zone,” while a growing list of freshmen, including right-handed pitchers Alex Kobersteen, Chris Knight, Blake Ripp and Gavin Ferrandino and southpaw Rich Pfluger, will have opportunities to contribute to the team right away. Raimo, who posted a 2.76 ERA across 71.2 innings last season, said without an individual positioned to fill the void left by last year’s primary pitchers, a leader from the mound can come from anywhere. With more depth on the mound to start the season due to fewer injuries and more experienced pitchers, Oliveri is hoping health will lead to more consistent play from the mound, along with making the most of both practice and in-game play time. “One of the challenges to the pitchers that we’ve talked about is having an urgency in every moment because every moment matters,” Oliveri said. Focused on making the Atlantic 10 Championship, Raimo said the team’s consistency will come through a mixture of good practice habits and a more confident mindset. “We’ve been working hard, we have our core values to have our mentality to be the best that we can and get guys out in a certain amount of pitches and to always have every 100 percent intent with our pitches behind it,” Raimo said.